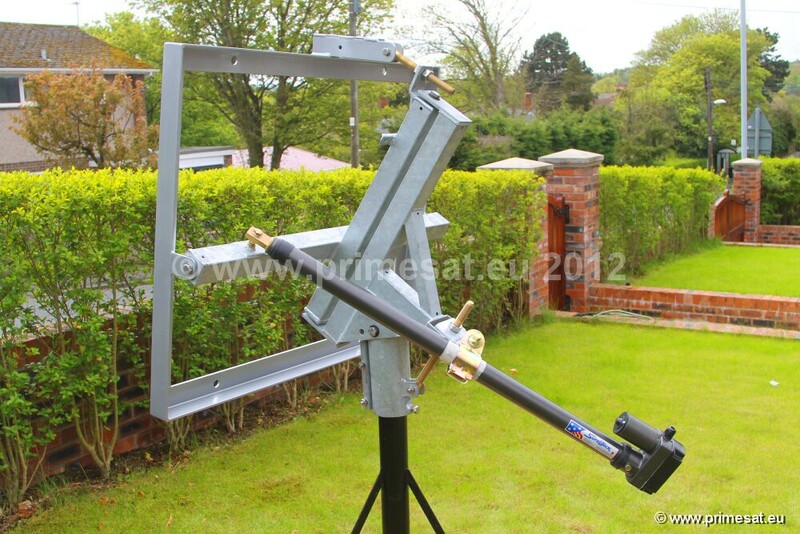 Satellite dish polar mounts. Inclined orbit polar mounts, motors for Raven, Andrews, Channel Master 1.2m, 1.8m and 2.4m dishes. Prime focus dish polar mounts. Polar mounts for Raven 1.2m, 1.8m and 2.4m. Standard and inclined orbit. Designed for the 1.2m Raven dish. 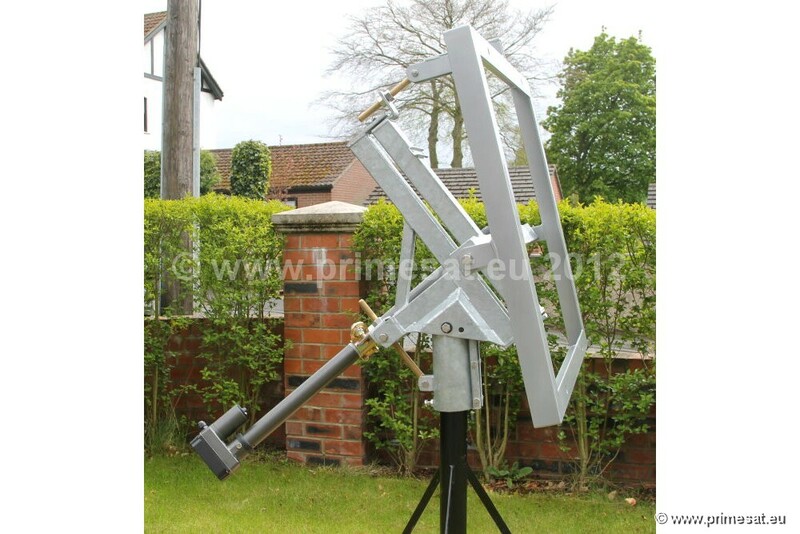 Primesat CH12MK4 heavy duty polar mount and actuator. The new Mk 4 has been completely redesigned compared to earlier versions. 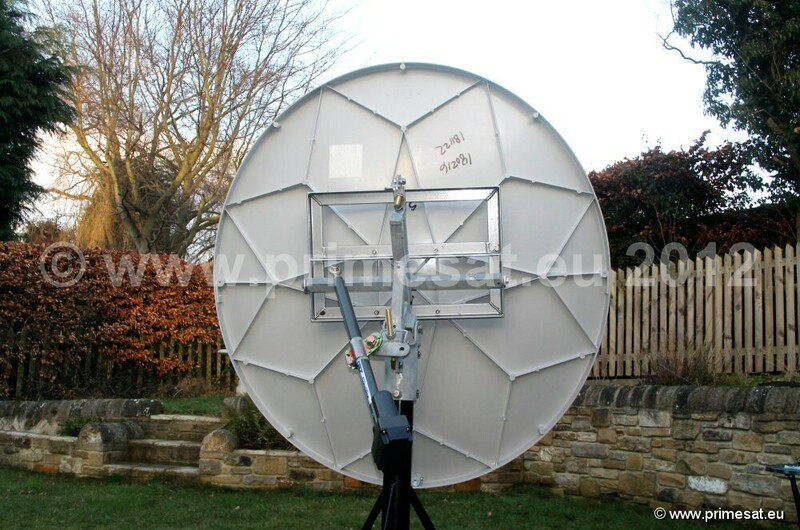 It is designed for the 1.2m Raven dish (dish not included). This mount is very well designed. The dish does not stand a long was away from the pole. With this latest Mk 4 version, the mount is a close and well balanced assembly. The framework is very strong and well engineered. Fine adjustment is easy with a spanner. Primesat CH12MK4 heavy duty polar mount and (optional) actuator. 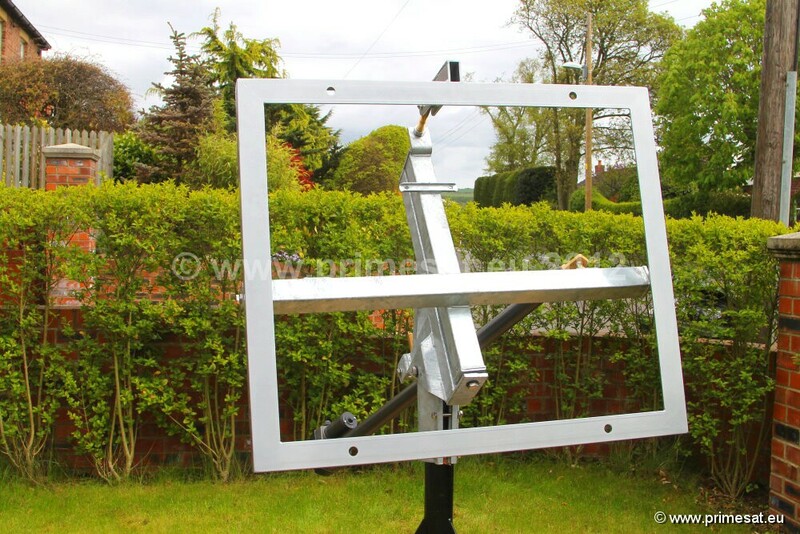 The polar mount is mostly "dipped galvanised". The "dish back plate frame" is etch primed, primed, top coated and baked in an oven to provide a durable finish. The rest of the mount including the collar is dipped galvanised. All of the nuts and bolts are made of stainless steel except the main elevation and declination adjusters which are made of brass. 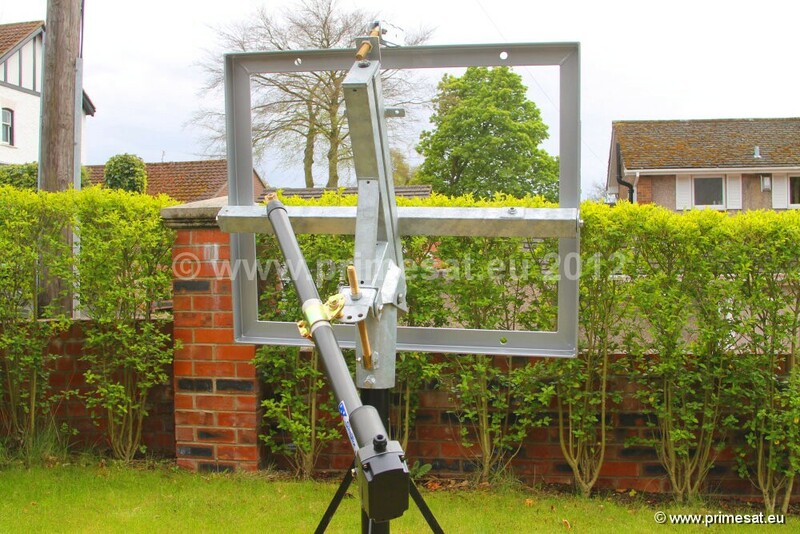 The polar mount includes a frame that is designed to fit on the back of the Raven 1.2m dish using the 4 bolts that come with the Raven dish. An optional, genuine Jaeger Superjack 18" HARL-3618+ actuator is available. Weight of polar mount 15Kg. Weight of 18-inch actuator 6Kg. Total weight 21Kg. Very heavy duty for the most exposed of locations. 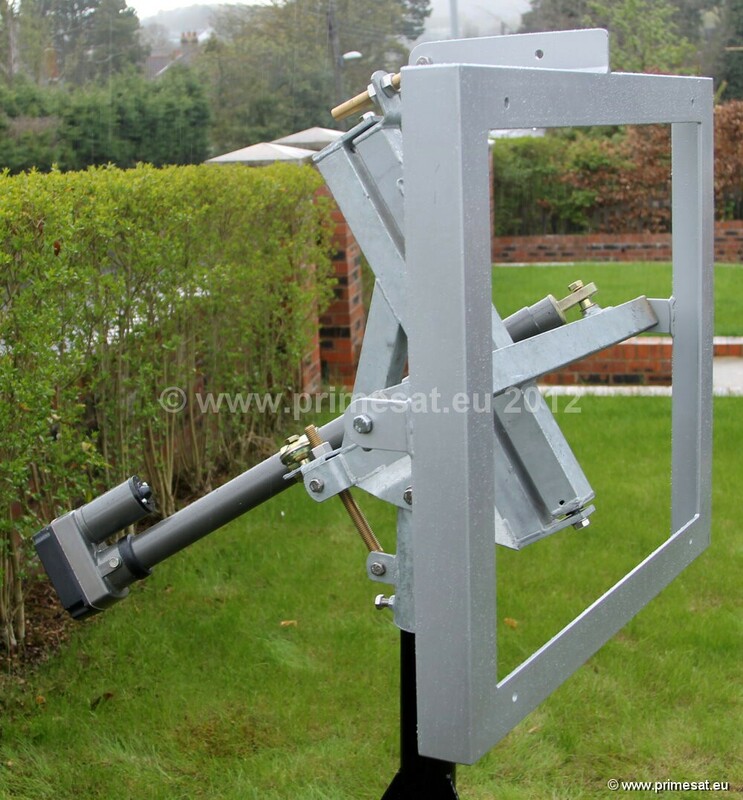 This polar mount and actuator can take high wind loads. The polar mount motor unit is designed to clamp onto a 76mm (3-inch) diameter pole. This motor unit also fits the 90cm and 1.0m Raven dishes. 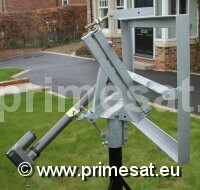 An ideal ground stand is the Primesat GS761FW ground stand. Note - Raven dishes were formally Andrews dishes and before that Channel Master. Update - An inclined orbit version of this mount is also available. Designed for the 1.8m Raven dish. 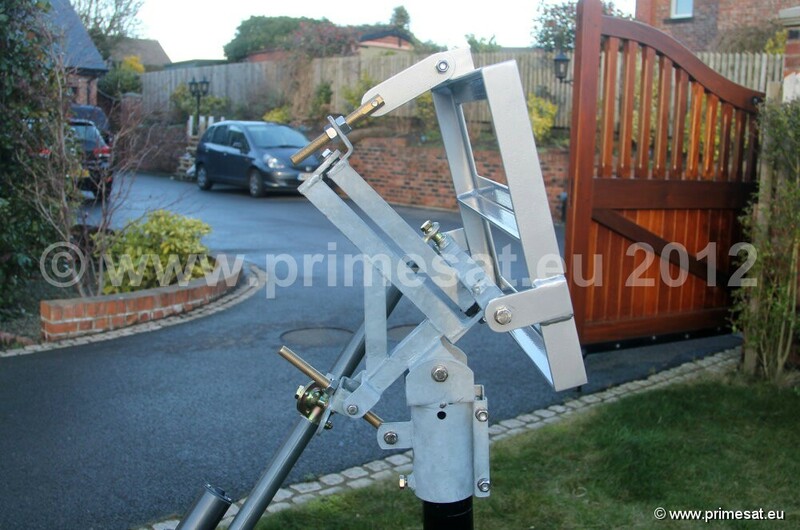 Primesat CH18MK2 heavy duty polar mount and actuator. This is the latest Mk 2 version. 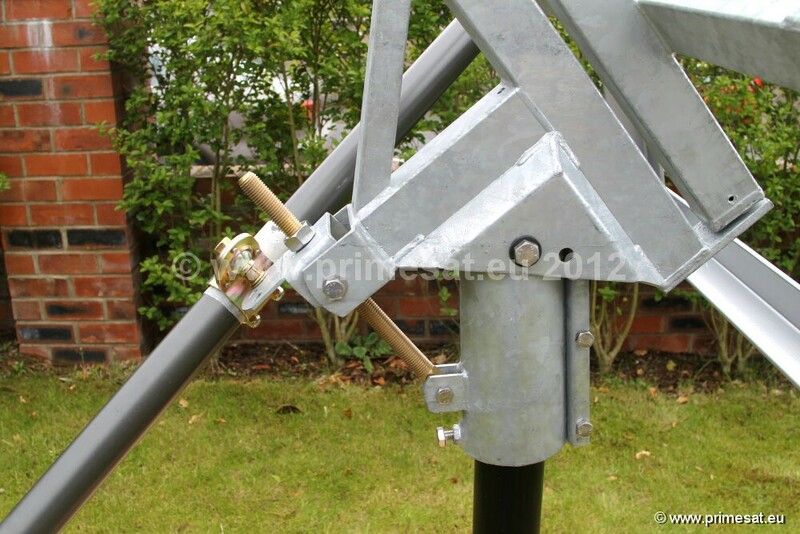 The polar mount is mostly "dipped galvanised". The "dish back plate frame" is etch primed, primed, top coated and baked in an oven to provide a durable finish. The rest of the mount including the collar is dipped galvanised. All of the nuts and bolts are made of stainless steel except the main elevation adjuster which is made of brass. 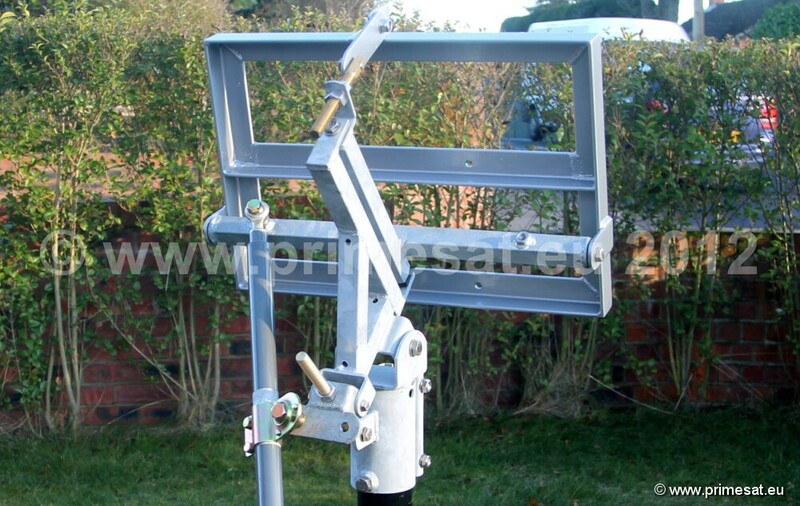 This heavy duty polar mount comes complete with an 24 inch heavy duty genuine Jaeger Superjack QARL-3624+ actuator. Weight of polar mount 29Kg. Weight of 24 inch actuator 8Kg. Total weight 37Kg. This polar mount motor unit is designed to clamp onto a 76mm (3-inch) diameter pole. An ideal ground stand is the Primesat GS76125 ground stand. Designed for the 2.4m Raven dish. Primesat CH24100 heavy duty polar mount and heavy duty actuator. This Polar Mount is only available as a complete kit including actuator. The elevation adjuster and the declination adjuster are made of brass. The bolts, nuts and washers are made of stainless steel. 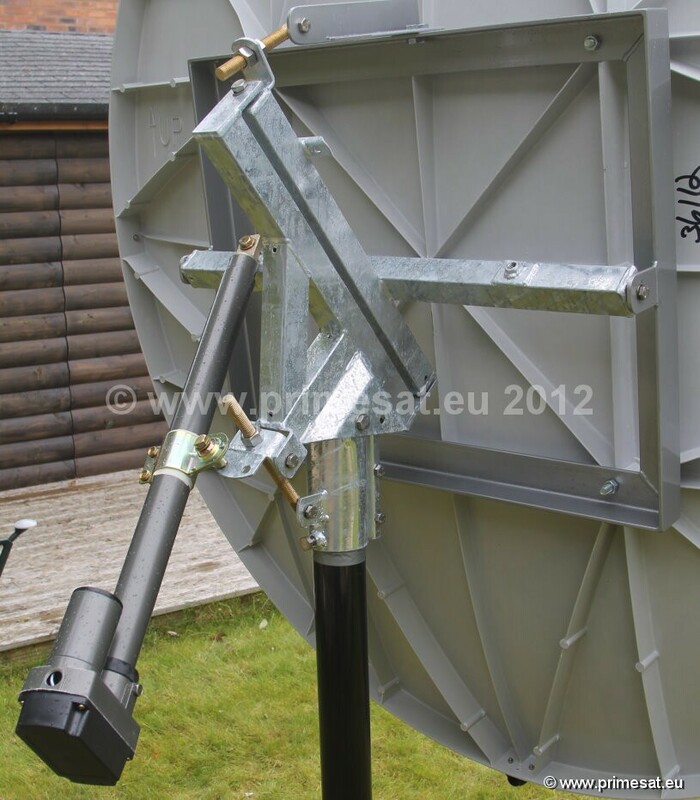 The polar mount includes a frame that is designed to fit on the back of the Raven 2.4m dish using the 4 bolts that come with the Raven dish. 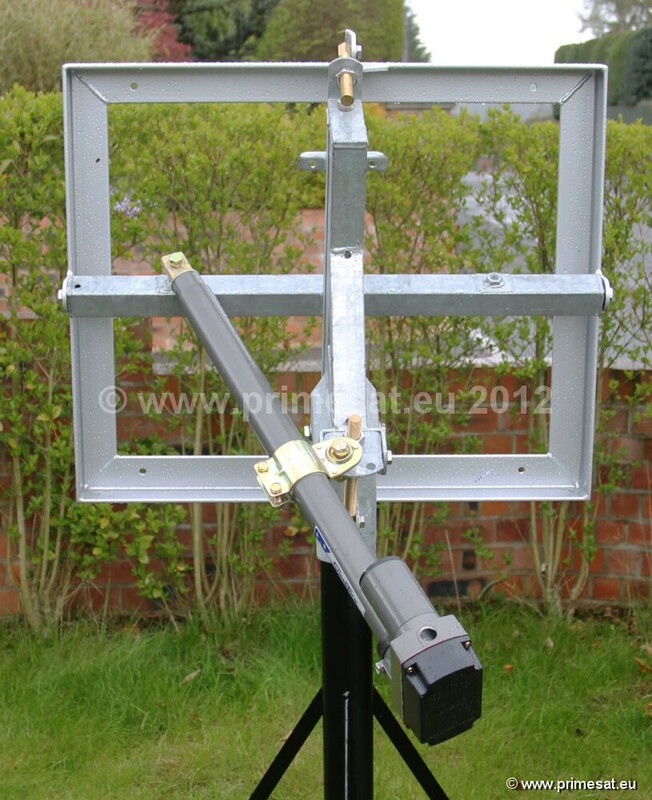 The polar mount is made of steel with many dipped galvanised parts. The dish back plate frame is etch primed, primed, then top coated and baked in an oven for a tough finish. 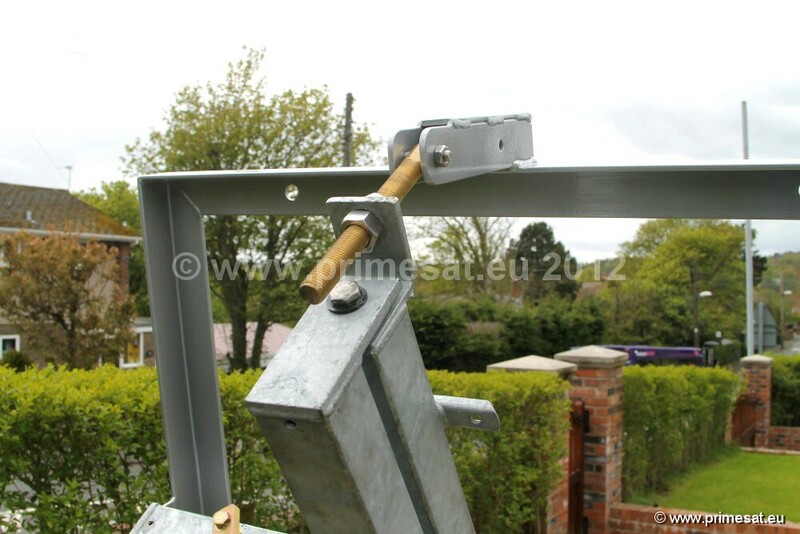 The rotating parts, collar and all items bolted to the frame are dipped galvanised. The collar is sitting on a 76mm pole but this is just for demonstration purposes. The correct pole diameter for this collar is 100mm (4 inches). 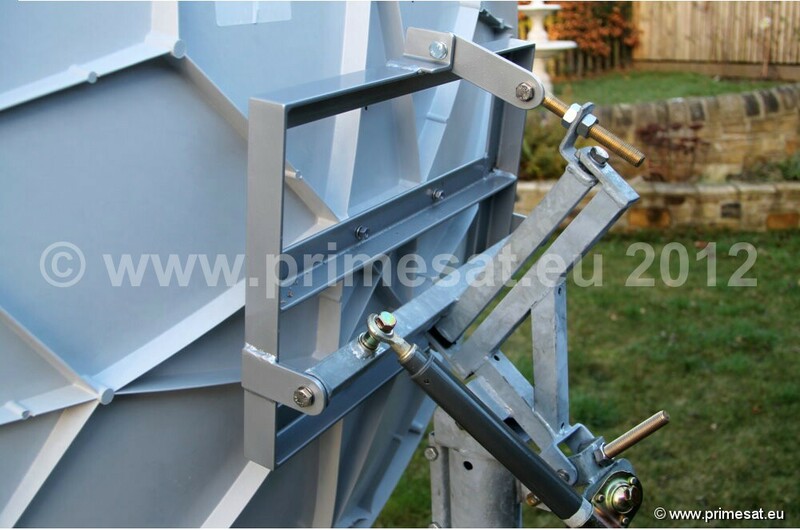 Primesat manufacture a ground stand with a 100mm diameter pole that is 1.6m high for this polar mount (and dish.) The actuator is a genuine Jaeger heavy duty QARL-3636+ 36-inch jack. The weight of the complete unit including actuator is 55Kg. 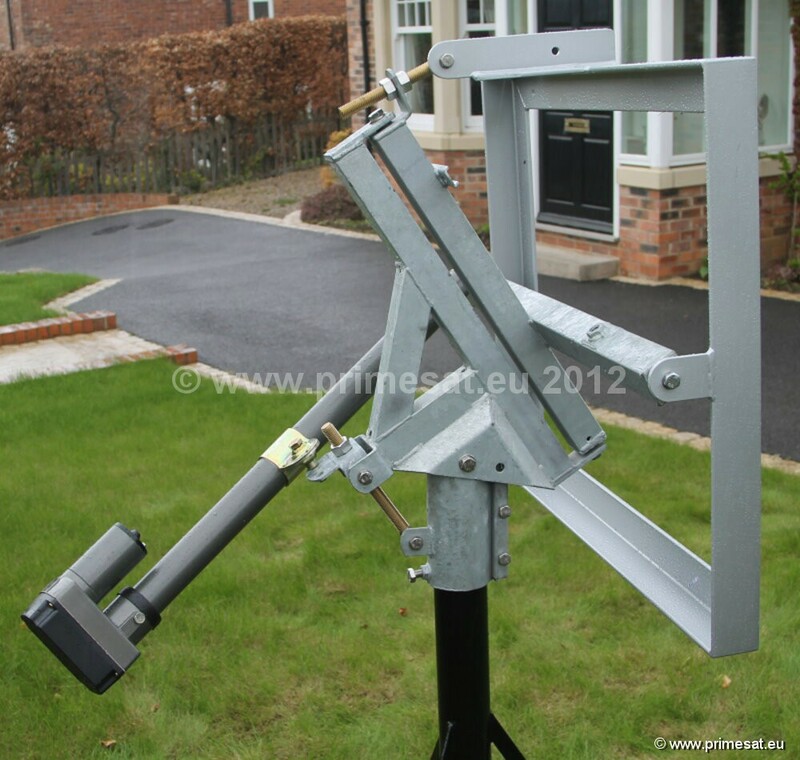 An ideal ground stand is the Primesat GS10016 ground stand.